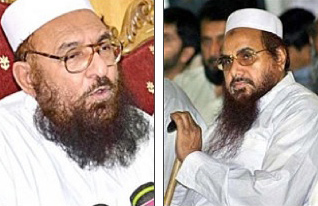 Hafiz Abdul Rahman Makki, left, and Hafiz Mohammed Saeed, right. Images from Rewards for Justice website. The US government has offered a $10 million bounty for the capture of Hafiz Mohammed Saeed, the founder of the Pakistan-based Lashkar-e-Taiba, or Army of the Pure. A lesser reward of $2 million is being offered for his brother-in-law, Hafiz Abdul Rahman Makki, the terror group’s deputy leader. The rewards for Saeed and Makki were announced by US Undersecretary of State Wendy Sherman at the Aspen Institute yesterday, The Times of India reported. Rewards for Justice, a program sponsored by the US State Department, added web pages for Saeed and Makki today. “Saeed is suspected of masterminding numerous terrorist attacks, including the 2008 Mumbai attacks, which resulted in the deaths of 166 people, including six American citizens,” Rewards for Justice continued. As The Times of India notes, Saeed has one of the highest bounties for his capture offered by the US government. Only al Qaeda emir Ayman al Zawahiri, at $25 million, has a higher bounty on his head. Saeed is now on par with Mullah Mohammed Omar, the head of the Taliban; Abu Du’a, the emir of al Qaeda in Iraq; and Yasin al Suri, a senior al Qaeda facilitator based in Iran; all have $10 million bounties. Saeed ranks above other terrorist leaders, including al Qaeda strategist and leader Saif al Adel and Movement of the Taliban in Pakistan emir Hakeemullah Mehsud. The bounty on Saeed is sure to make waves in Pakistan, as Saeed is a public figure and popular among millions of Islamists and nationalists in the country. Saeed regularly appears on Pakistani television and is known to dine with top Pakistani Army generals. Given Saeed’s popularity and his value to Pakistan’s military and intelligence service, it is highly unlikely Pakistan will lift a finger to detain Saeed. For years, US officials have complained about Pakistan’s unwillingness to deal with the terror group he founded, the Lashkar-e-Taiba, despite repeated pleas to have it dismantled. Osama bin Laden and his mentor Abdullah Azzam encouraged Saeed to form Lashkar-e-Taiba in the late 1980s, and helped fund the establishment of the terror outfit. Lashkar-e-Taiba, like al Qaeda, calls for the establishment of a global caliphate and receives funding from Saudis and other wealthy individuals throughout the Middle East. Lashkar-e-Taiba is an ally of al Qaeda; the two groups provide support for each other, and their operatives train in each other’s camps. Lashkar-e-Taiba has established training camps in Kunar province in Afghanistan, Pakistan’s Khyber Pakhtunkhwa Province and the tribal areas, and in Pakistan-occupied Kashmir and the Northern Areas. Lashkar-e-Taiba forces fought alongside al Qaeda and Taliban fighters in the assault on the US combat outpost in Wanat in Nuristan province, Afghanistan in July of 2008. Nine US troops were killed, and 15 US soldiers and four Afghan troops were wounded in the heavy fight that nearly culminated in the outpost being overrun. US forces ultimately beat back the attack, but abandoned the outpost days later. Lashkar-e-Taiba has an extensive network in Southern and Southeast Asia, where it seeks to establish a Muslim caliphate. The group essentially runs a state within a state in Pakistan; the group has established an organization that is as effective as Lebanese Hezbollah. Its sprawling Muridke complex, just northwest of Lahore in Punjab province, is a town of its own. Throughout Pakistan and Pakistan-occupied Kashmir, Lashkar-e-Taiba runs numerous hospitals, clinics, schools, mosques, and other services. In support of its activities, Lashkar is active in fundraising across the Middle East and South Asia, and the group has recruited scores of Westerners to train in its camps. In 2005, the group succeeded in providing aid to earthquake-ravaged regions in Kashmir while the Pakistani government was slow to act. Over the last several years, Lashkar-e-Taiba provided relief to tens of thousands of internally displaced persons who have fled the fighting between the military and the Taliban in the Malakand Division as well as those impacted by the devastating floods in Pakistan in 2010. The US government designated Lashkar-e-Taiba as a Foreign Terrorist Organization in December 2001. The Pakistani government banned the group in January 2002, but this did little to shut down its operations. The group renamed itself the Jamaat-ud-Dawa and conducted business as usual. After Mumbai, the Jamaat-ud-Dawa used the name Falah-i Insaniat Foundation (FIF), and continued fundraising and other activities. The US designated the FIF as a terrorist group in November 2010. Three FIF/Lashkar-e-Taiba leaders were also added by the US to the list of Specially Designated Global Terrorists. In reality, Saeed and his leaders rebranded the group as a Muslim charity to mask the operations of Lashkar-e-Taiba. Saeed has been arrested several times by Pakistani security forces after attacks in India, but each time has been quietly released. After Mumbai, Pakistan claimed to shut down Lashkar-e-Taiba/Jamaat-ud-Dawa offices and camps, and detained followers, but the efforts were largely cosmetic. Saeed was placed under a loose house arrest in December 2008, but by August 2009, the Lahore High Court said the government did not have grounds to keep him under house arrest. Saeed and the Laskhar-e-Taiba have strong links with elements within Pakistan’s military and the Inter-Services Intelligence Directorate, or ISI. The Lashkar-e-Taiba is one of the primary terror groups used by Pakistan’s ISI to direct military and terror operations inside India and Indian-held Kashmir. During the 1999 Kargil War, when Pakistan invaded Indian-held Kashmir, the Lashkar-e-Taiba fought as the vanguard for Pakistani forces in the mountainous region. To this day, Lashkar-e-Taiba military and terror units continue to infiltrate into the Indian state of Jammu and Kashmir, with the help of Pakistan’s military. Holy two-faced jihad! Didn’t see this one coming. Hamid Gul and Pervez Musharaf should be next. I wonder if there is more to this story; like there is sealed evidence that the LeT was behind bin Laden’s decade-long shelter in Pakistan. Once the Generals and Colonels and Majors find that they cannot safely travel outside of the confines of their rogue state, their ill-gotten extorted millions will be of limited value. A good sign that the Indians and the Americans are working together. A strong and open message to the Pakistani establishment. The more moves to isolate Pakistan with an encirclement strategy in tandem with Pak’s neighbors the better. Also, this is good food for thought for Pakistani civil society in general to reconsider the violent society they have bred which ironically they pay the greatest price for in blood, in their bleeding economy and in being bereft of any real dignity. It may not be important but the US State Department messed up in saying that Lashkar is a Deobandi organisation. It looks like the US want to embarrass Pakistan more, because of Pakistan’s lack of enthusiasm in tackling terrorists, who are mainly supported by the ISI, who effectively run Pakistan’s foreign policy. I doubt the US would send a drone to kill Hafiz Saeed and I also doubt that the Pakistani’s would arrest Hafiz Saeed, because Saeed is a puppet created by Pakistan’s ISI. This bounty is basically saying to Pakistan, I will embarrass you more, until you stop training islamic terrorists fighting against India and Afghanistan. The fact remains Hafiz Saeed has been under U.N.
thanx USA,these monsters deserve to be brought to justice. Time to designate Pakistan a state sponsor of terror and cut all funding. Since Hafiz roams around freely and dines with the generals, give Pakistan 10 days to hand over Hafiz, and if they don’t, start turning the sponsor of terrorism screws. Actually Pakistan should head this list, and is the pivot of the axis of evil, as our troops (many wounded and maimed) will tell you. is this the first bounty offered for this guy ? Should have bounties on the Pak Generals past and present as they are running/controlling the terrorists. I have a problem anytime we call these guys “masterminds”. They are simpletons. I thought Mullah Omar had been removed from the list? This guy is a huge star with the Pakistan government. According to just about every news report out there, he has always been extremely tight with the Pakistani military, ISI, and everyone else. After 9/11 the organization was “banned” in Pakistan but this was a complete joke. As LeT is mainly an anti-India organization, it will ALWAYS be safe in Pakistan. A $10 million reward will mean very little there. It wasn’t through oversight that they haven’t gone after him. Hafiz Saeed has been on the list forever. As long as Pakistan kept the supply lines going the U.S. refrains from going after him. Pakistan is no longer cooperating on supplies, so why not go after him! It’s not like the Pakistani’s are refraining from targeting NATO troops, albeit indirectly through the Taliban. Why not more discussion on the funding ties to Saudi Arabia, Bahrain and other GCC states? Who is footing the reward bill? US tax payer for sure. Who are the “other wealthy individuals”? Care to wager most are Sunni and member of a royal family. Loyal allies to the USA no doubt. Sorry but it’s a hard swallow linking this crowd to Iran. Who is footing the reward bill? US tax payer for sure. A little bit off the issue of the article but where is Mullah Omar? Like OBL I guess he is hiding somewhere in Pakistan but my point is why is this not as big an issue as the ‘fact’ the the Pakistanis where hiding OBL? Are we actually actively looking for Mullah Omar? I mean it seems we have readily accepted the fact that he will be living comfortably in a Taliban compound somewhere in Pakistan and we have decided to just let the Pakistanis have a free pass on this and not pressure them to reveal or find his location. He no doubt is nothing more than a figure head for the Taliban now but it would be a great propaganda coup and an excellent negotiating piece to have. Villiger, I don’t want to rain on your parade, but India is a worthless ally in this battle. They should have placed this bounty themselves a long time ago, and at the very least doubled it after the US shamed them for their inaction. There were thirty times more Indian casualties from the Mumbai terrorism attacks, and the Indian government has shown thirty thousand times more apathy in their response to their civilian deaths. Contrast this to how Israel responds to state-sponsored terrorism. I don’t know what exactly the US was signalling to Pakistan by placing this bounty, but I seriously doubt that it was coordinated with the pusillanimous Indian government. Pakistan, Iran,Saudi Arabia and North Korea the new axis of evil? I think we need to start getting serious with the Pakis about getting these people or tell them they risk getting ZERO aid from us on any level. Either that or we just go in and get them ourselves like we did OBL, with Tier 1 units like Delta or SEAL 6. Anyone who has ever been in Afghanistan and been involved in Spec Ops has seen intel on the Pakis…and we all know that they have been harboring guys like Saeed and Mullah Omar for years. We either do what we need to do and take these guys down or we risk not winning the war 100%. That’s just my take as a fomer grunt. Charu, i agree with you on India’s own inactions and you make a good point. However, i don’t blame India for her own concerns of the way the US has managed this whole war, including being damagingly distracted by Iraq, the limitations of the strength and timing of the surge, the premature announcements of drawdown timelines, the lack of an effective strategy in dealing with Pakistan etc. Many of us here have expressed our concerns on some, if not all, of these issues. What kind of confidence can India have when she sees the Pakistanis, whose conniving ways India knows only too well, running ever tighter circles around the US, the UK and ISAF? The UK for one should clearly have known better having ruled the area as to what works and what doesn’t. Another matter relates to the US holding on to its equation of India and Pakistan. Yes the nuclear deal was a big step but Hillary undermined its diplomatic/political power some time back, by uttering that the US would consider a similar deal with Pak when she knew it simply wasn’t gonna happen. Obama on the eve of his trip to India announced that in the following year, 2011, he would visit Pakistan, thereby stupidly equating India with the imbecilic Pakistan. These appeasements have proven to be great miscalculations when any of us here could see right at that time that is what they were. So lets recognise, America simply hasn’t been bold enough when it comes to dealing with Pakistan. Therefore, India, already given to avoiding confrontations, sits on her hands and says well lets see what the US makes of this mess. There comes a tipping point where i suspect India could do much much more but she needs to see the US not just working hard but also working smart which means intimate cooperation with India and setting her clearly apart from Pakistan, the US’s longstanding ally of choice. The message is so clear and obvious, neither country can do individually what can be achieved together. To that extent, comparisons are pointless. Going beyond this, America needs to build a solid diplomatic consensus in the region amongst Pak’s neighbours to reign in the rogue and get it on the straight and narrow. This would include Russia and the ‘stans and with or without China and Iran. Charu, also i don’t know if you saw the reports that the US may need to ask India for help on its logistics if the Pak discussions should fail. This provides addl context to the Hafiz Saeed reward, a symbol to India and a little grease to the wheels. Surprisingly, or not so surprisingly, the MSM in the US has failed to cover this–too subtle for their sleepy brains. Charley, i couldn’t agree with you more. Even if 10 days is unrealistic a quantum thrust is required in that direction. Devin, its time to agree. And i’m glad you’re shooting for 100%. Which means subjugating the Taliban and putting Paqistan in its place–tightly sequestered in its own pathetic territory and diplomatically cornered and contrite. Sounds like a tall order but take into account that at heart the Paqis are cowards and, other than their unfortunate nuclear arsenal, they actually don’t have the muscles to flex. They have forfeited their right to be dealt in a civil way. They have their vulnerabilities: a 2-bit economy, reliance on the World Bank, reliance on US dole-outs, trade sanctions, the corrupt Generals’ bank accounts, the Durand Line, the Baluchistan insurgency, water routed through India, India’s historical superior military. All these need to be exploited step-by-step in a measured way to tame this animal. This SOB was taunting at the USA. I read in Yahoo News last night, he said, he would be in Lahore, Pakistan, Thursday. I always heard, that it was easier to ask for forgiveness than, to ask for permisson so, screw Pakistan, let’s go get him, and, any others that want to be near him. villiger- I agree that the Iraq war was a huge distraction from the fight in Afghanistan (and that is hard to admit considering I fought in Iraq for several years), But I disagree about the surge effect in Afghanistan. Obama made the right call with the surge. Thousands of Taliban mid and top level commanders were killed and they lost major amounts of territory. The surge was a success, IMHO. The problem is that we have droped the COIN strategy we were employing for the Biden plan of limited Spec Ops missions and drone strikes and ANSF funding. This may or may not work, but we have the best Spec Ops in the world and the CIA is top class, so if we fund the mission correctly we have a better then 50-50 chance.